DELICIOUSLY-FLAVORED AND VITAMIN-ENRICHED WATERS CONVENIENTLY MADE AT HOME IN INFUSION PITCHERS OR BOTTLES Everyone knows that drinking more water is the fastest, simplest step to improving health. But it's also the most boring and tasteless step. Until now! Water Infusions makes it easy to stay hydrated, keep one's system flushed and get the right amount of water every day while actually enjoying organically delicious beverages. 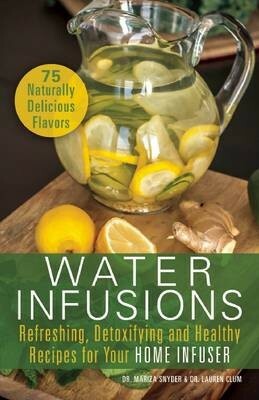 Instead of chemical-enhanced, calorie-packed store-bought water, the 75 recipes in this book pack flavorful fruits, veggies, herbs and essential oils into thirst-quenching, detoxifying waters that are 100% natural. Featuring flavorful recipes like the cleansing Lemon and Cucumber Mint, the immunity-boosting Orange Blast, and the fizzy Strawberry Lime Soda, this is the ultimate guide to getting the most out of your infuser. More than a recipe book, this informative handbook details the vital relationship between water and good health. It also provides nutritional information on the various fruit and vegetable readers can use in their infusers while separating truth from myth on the importance of water in one's diet.